How do I Stop Leather Gear From Creaking? Treat your leather properly to maintain its appearance. 1 How do I Stop Leather Gear From Creaking? Leather will last for many years if you treat it right. Don't neglect it and let it fall apart; condition it and protect it with quality products. Some things are beyond your control, however, such as an occasional scuff or scratch. Luckily, there are simple ways to fix a scuff on a leather jacket that do not cost a lot of money. Rub leather lotion on the scuffed area. Apply it according to the manufacturer's directions using a clean cloth. This may be all you need to do to remove a little scuff. Do not use lotions that contain silicone or wax because this can dry your leather out. Buff nubuck leather with a nubuck cloth. Nubuck has no pigments, but has a velvety finish. Just buff the scuff in a semi-circular motion with the nubuck cloth until the scuff disappears. Heat the leather if the scuff does not respond to buffing with lotion. This works on aniline leather, which is a leather with no pigments added to it, but without the velvety finish like the nubuck leather. Aim a blowdryer at the scuffed area and massage the scuff while you are heating it. Apply a leather protector over the area when you are done. Follow the manufacturer's instructions as to how to apply the protector. Dye the leather if the scuff is still visible. You can purchase leather dye at most leather stores or online. Follow the directions on the product as to how to apply the dye, as instructions will vary. 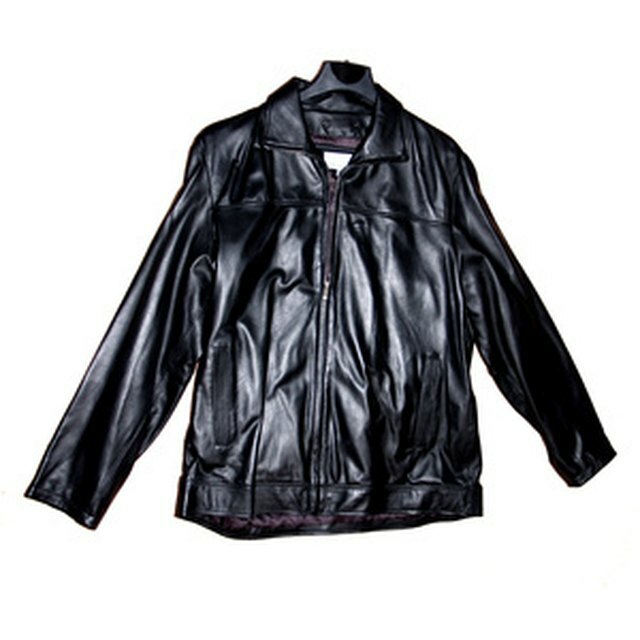 Store your leather jacket in an area that is cool and dry, and not damp. Never store it in plastic because this can cause mildew to form. Leather and Vinyl MD: Aniline, Nubuck, Protected, What Do These Terms Mean?